Special Limited Edition, with a special exclusive print on the title page signed by Brissaud. Only 1500 of these exist. Front Binding – The Heritage Press began in 1935 with a fine set of six books exclusive at the time to that imprint (with some remaining so), but George Macy decided to celebrate his second major printing business by creating 1,500 limited edition copies of those six, and gave the LEC membership first crack at them. I’ve gone into more detail about these on The Pickwick Papers (due to Dickens’ David Copperfield being in that initial salvo), but I’ll summarize — Manon Lescaut is one of those, with the aforementioned Dickens, plus Romeo and Juliet, The Scarlet Letter, A Shropshire Lad and The Song of Songs. For these limited versions, the bindings are distinctly different from the standard printing and feature a signature of the artist somewhere within, usually with an exclusive print. 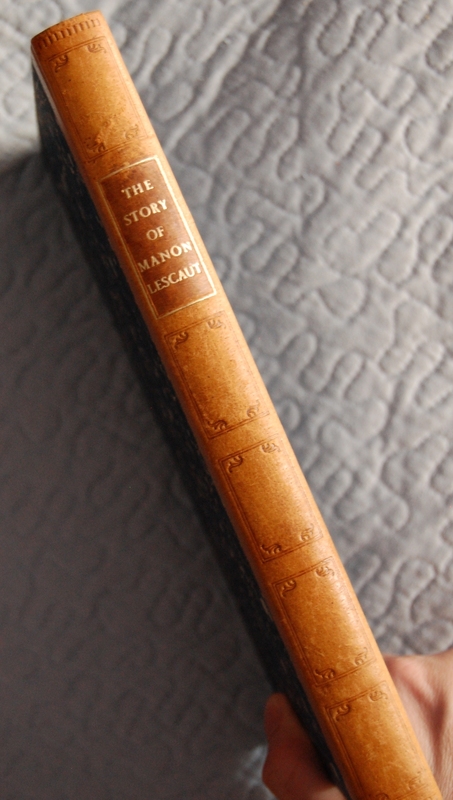 This copy of Manon Lescaut is one of those 1,500 copies. Buss1. Bussaco, Michael C. Heritage Press Annotative Bibliography Volume Three Authors L-R. Second edition. (Archibald, PA: Tribute Books, 2008). Buss2. ———–. Heritage Press Catalog & Checklist. Second edition. (Eynon, PA: Tribute Books, 2008). Ransom. Ransom, Will. NY: Philip C. Duschnes, 1963. Ransom (p. 91, no. 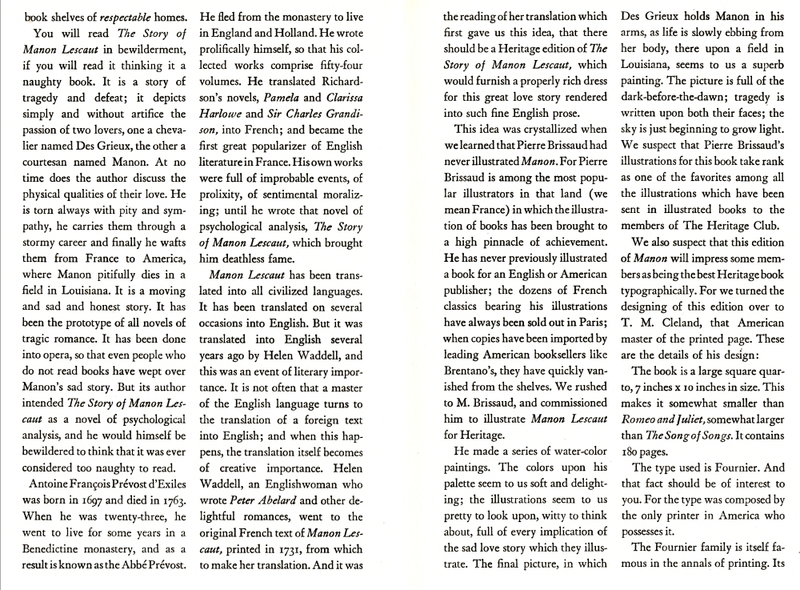 6) notes that 3000 copies in leather of the first edition of Manon were printed. Ransom notes, as does Wildcat (link above), the first 6 books all had 1500 copies issued with an extra illustration signed by the artist . What is not made clear is whether the 3000 total included the 1500 specials or if the specials were in addition to them. Regarding the illustrations, Wildcat notes the signed frontispiece in his copy of the special issue is “far sharper and more colorful” than the others. That may be due to its having been separately printed by a different process than those in the text, as it appears to have been tipped in prior to binding. NOTE: The entries in Buss1 indicate 11 illustrations for the special issue and 10 for the regular. Well, my copy of the regular has eight (8) illustrations and my special has nine (9). According to Buss1, there were two issues of the special version (p. 155, #BHP-D 107-J & p. 156, BHP-FS-6-A). I assume the first, with the dual imprint of the HC and the Nonesuch Press (as in Wildcat’s copy) refers to those copies which were issued to LEC members, as they were not issued with a Sandglass (Buss1, p. 155). My copy is of the second version (Buss1, p. 156) which was issued to HC members with a Sandglass (First Series 6-A) per Buss1. The title page on this issue has no mention of the Nonesuch Press. It reads: New York/THE HERITAGE PRESS/1935. Binding. Both the regular and the special issues are bound in 1/4 leather over marbled paper on the boards. 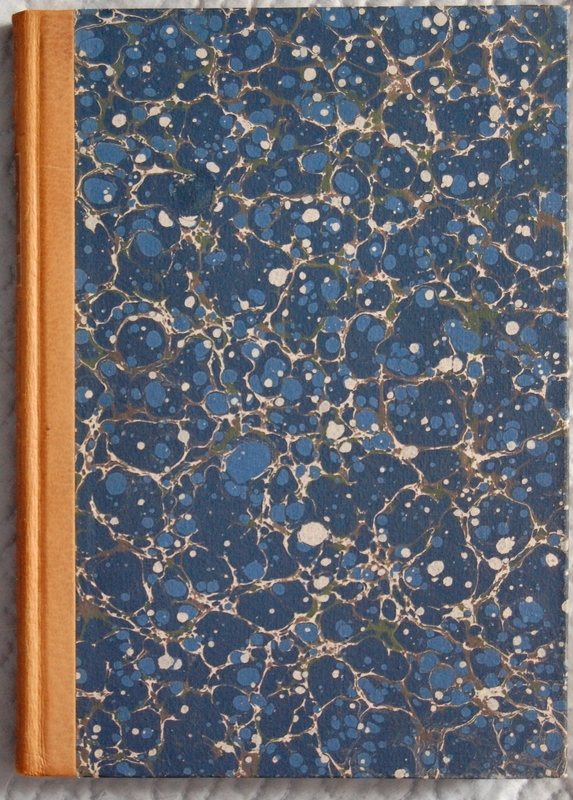 The special issue appears to be brown calf or a similar smooth skin, whereas the regular issue is bound in brown pigskin and not, as some folks have stated, “faux leather.” The blue marbled paper of the special issue appears to be hand-marbled whereas the brown marbling on the regular issues is a printed design. I should also note that the spine of the special issue has several panels blind-stamped into it in addition to the title panel whereas the regular issue has only the title panel. In Buss2 (p 11), the binding of the regular edition (BHP-FS-6) is described as “French marbled paper over 1/2 pigskin binding,” but as noted above, it is 1/4 leather. If it were 1/2 leather, either the corners would be leather covered or the spine leather would extend out to half way across the board. Either way, 1/2 the width of the cover board in total would have leather on it. The same error is repeated for the special issue lower down the page. This title was re-issued several times subsequently. I have both issues of Manon. The later edition with the pigskin leather quarter binding has Sandglass 3K, which indicates an issue in August, 1946, and states that the sides are covered with a “French marbled paper.” I tend to think it is marbled paper and not a printed design. As Glacierman posts, the Sandglass affirms “genuine pigskin.” Alas, the pigskin has not held up well at all, compared to the leather on the first, special, edition: the pigskin is cracked and detached from the text block in several places, and as I was reading it during my convalescence…one piece at the top fell off. In addition, the paper, “a sparkling white paper made for this book by the Collins manufacturing Company…of rag content…of a better quality than any paper we got in the war years,” did not remain sparking white, but has turned beige. The paper in the first edition is still “sparkling white” but since I don’t have a Sandglass, I don’t know who made that paper. 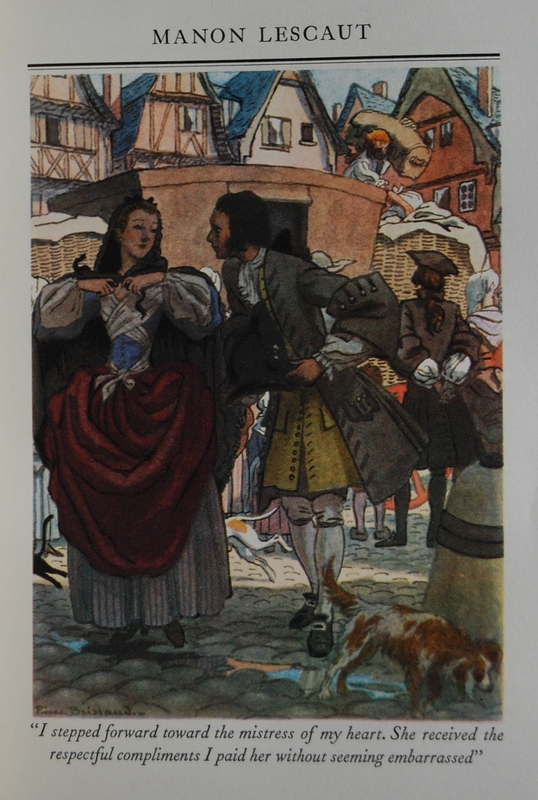 The illustrations in the later edition are poorly reproduced compared to the ones in the first HP edition; the Sandglass makes no reference to who did the reproductions of Brissaud’s watercolors in the later edition, but they are very muddy compared to the bright colors in the first HP. I confess that I had never read Manon before (having been very familiar with the story through the 2 operas) until the last few weeks, when I was recuperating from knee replacement surgery. I decided to do so after watching a video of the Peter Wimsey story “Clouds of Witness,” in which copies of Manon provide a valuable clue. I fear that the story itself is one that has the greatest appeal for men who are in the throes of, or have only recently experienced, what the French call l’amour fou, or, as in the title of one of my favorite old films, “Mad Love.” I found myself getting so impatient with Des Grieux, that twice I had to put the book down for a day or so before I could continue, with the result that it took me a week to finish what I should have been able to read in a day. Incidentally, for all completists, the HP includes in an appendix the episode of the Italian prince, which was a later addition by Prévost. It doesn’t really add anything essential, and simply piles on another case of the fatal lure Manon has for men–of which cases there are already more than enough in the story. The Sandglass I got with it is, unfortunately, not the proper one for the limited edition (which may not have come with a Sandglass at all, per the above commentary), but it states that T.M. Cleland was responsible for the design. Cleland illustrated for Macy on top of designing lovely books (see Monsieur Beauclare) but in this case French watercolorist Pierre Brissaud was recruited for the task. As for other design notes, Cleland went with A. Colish’s Fournier type, which the printers at The Nonesuch Press set at 14-point. 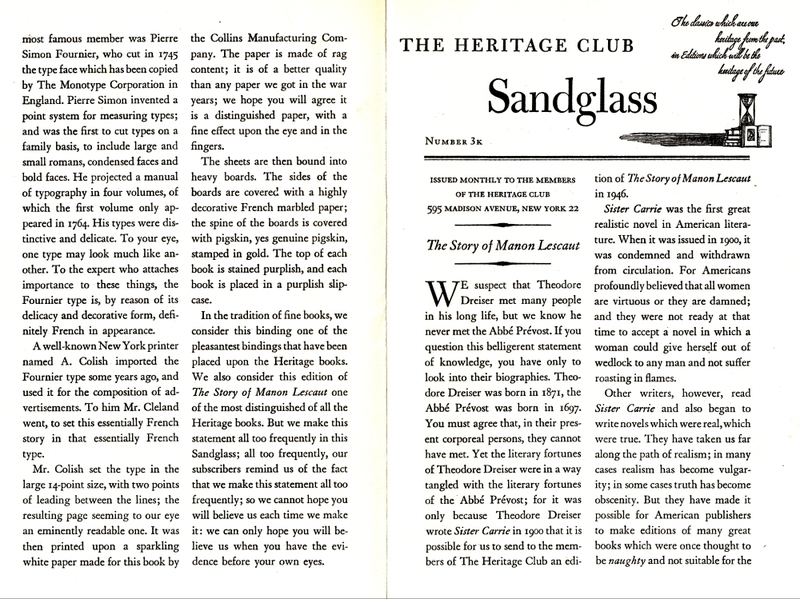 The later Sandglass makes no mention of who printed those editions. The Nonesuch Press was tightly knit with the George Macy Company for a considerable time — Macy briefly owned the press from the late 1930’s to the 1950’s, and was good friends with Sir Francis Meynell, its founder. Nonesuch collaborated with Macy on a set of Dickens for the Heritage Press and a series of some French romances, among other things. Meynell also provided an introduction to George Meredith’s The Shaving of Shagpat, which is fitting since he was the author’s godson. His mother was well-known suffragist and poet Alice Meynell. Finally, in terms of the paper, the standard print used Collins Manufacturing Company paper as noted above, but I’m not sure who provided it for the limited set. Brissaud began his Macy contributions here, and he would have been the original Cyrano de Bergerac (1936) artist if it weren’t for the chaos leading into World War II that sent Brissaud into hiding during the German occupation. Luckily, Brissaud survived and resumed his output for the Macy houses in 1950, which the Cyrano link above goes into more detail. I did get a slipcase for this, but it’s not all that amazing and it’s a bit fragile, so I refrained from photographing it. 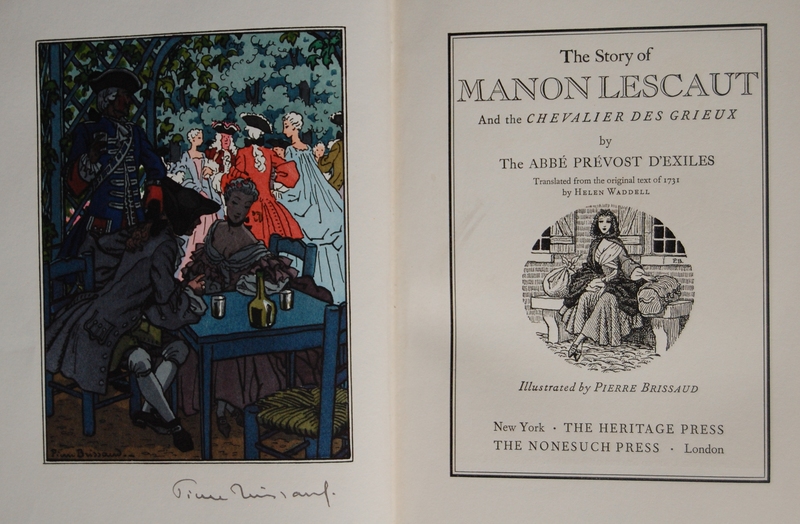 Title Page – For Manon Lescaut, Brissaud’s signature is on the title page with an exclusive print that is, to my knowledge, not in the reprints. I looked at a variety of standard printings while browsing and did not see this reprinted at all. Later illustrations were bumped up into its place, and one even had the left side blank. I’m not 100% sure of the publishing era of any of those, but I’ll try to check next time I’m at the same shop. This print is distinctly different from the rest of Brissaud’s watercolors gracing the book — it’s far sharper and more colorful. The effective shading is just wonderful. I suspect that this is a tipped in print of a much higher quality exclusive to this edition. Page 6 – I originally wrote here I needed to collect all of Brissaud’s work; I think I’m nearly there now! I like the dogs in this piece — it adds a lot to the overall liveliness of the painting. Personal Notes – As I was perusing my favorite shop, I noticed this book and thought that it was something unique. I had no idea how unique it was until I began comparing it to other editions (of which there were ample supply), and Brissaud’s signature just didn’t seem real to be in a Heritage book (I had not done the research on the first six prior to this discovery!) in such a prominent place…but yet there it was, and it was $15! The boards were luscious compared to the others, and that title page art was so bold…I knew I had something special. I checked on it in the hotel room and was delighted to see my instinct was right — I did pick up a special printing of an exquisite book. Special thanks to Glacierman and Django6924 for additional insights. 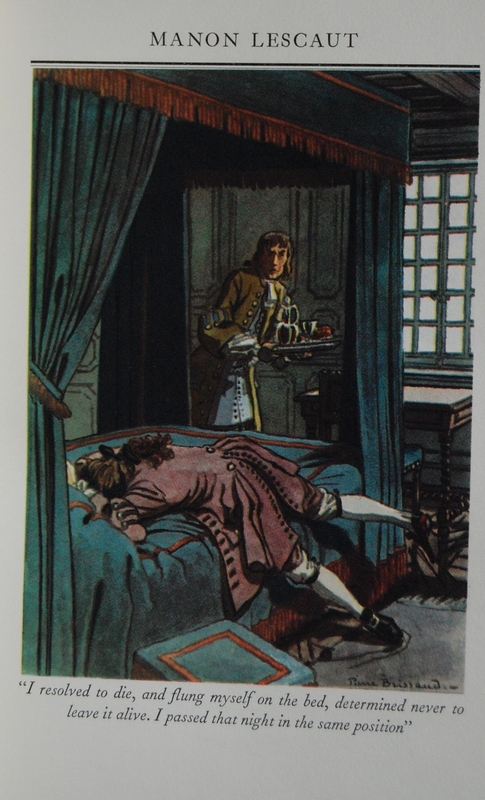 You are currently reading Heritage Press – The Story of Manon Lescaut by the Abbé Prévost (1935) at The George Macy Imagery.